The T2 sagittal and axials are the money shots in the neck. First, look at the sagittals. Number the vertebrae, starting with the unique C2 with its odontoid process (dens) towering high from its body. Going down from C3, each vertebra looks like a rectangle. In an older patient, osteophytes and spurs will be more visible anteriorly, but posteriorly they may be less obvious but more significant! Check the vertebra for fracture, cancer or hemangioma in the form of marrow signal changes within the vertebral bodies. Alignment is evaluated on the T2 sagittals. 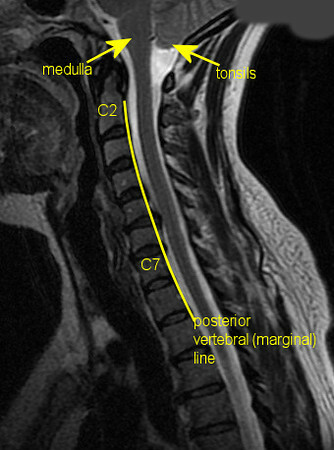 Follow the posterior vertebral line (posterior marginal line) from the back edge of C2 through the back edge of T1. Traumatic C-spine fracture or ligamentous laxity may allow anterolisthesis of one vertebra on another. This is more common at C3-4 and C7-T1, but more significant at C4-5, C5-6, and C6-7. So what you’re looking for here is anterior displacement of one vertebra on another. Next, evaluate the discs, paying attention to disc height and herniations. A disc protrusion may be parasagittal and be visible in the midline T2 sagittal images, or lateral in the neuroforamen seen best on the T2 axials. 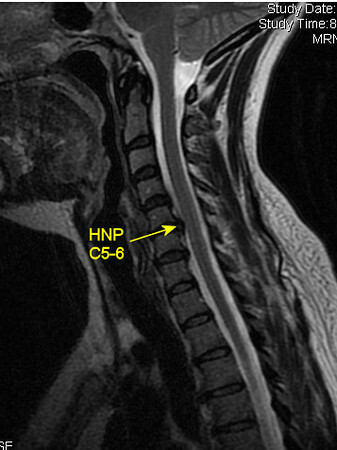 At the cervical medullary junction, you’re looking for two things: Chiari malformation, where the cerebellar tonsils descend into the foramen magnum, crowding the cord, and impeding the free flow of CSF in and out of the head. Or you may see an infiltrating tumor in the medulla. In a patient with rheumatoid arthritis you may see a pannus at the C1-2 ventral cord, crowding the cord and even displacing it. Now examine the cord on the T2 sagittals. Its gray signal should be evenly homogenous throughout, from the medulla into the thoracic cord. Increased T2 signal (a bright spot) within the cord is seen with severe stenosis or cord trauma. An intramedullary tumor within the substance of the cord may have decreased T2 or T1 signal (a dark spot). If you see this, get images with gadolinium contrast to look for an enhancing tumor such as astrocytoma. 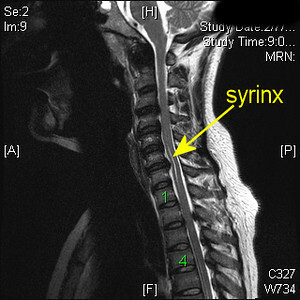 A syrinx (syringomyelia, or hydromyelia) will appear as a white line running up and down the middle of the cord. This is an abnormal CSF collection within the cord. A syrinx is often associated with a Chiari malformation, so if you see a syrinx, check for low hanging tonsils.